Jaipur, Rajasthan, India: Monkey Temple. 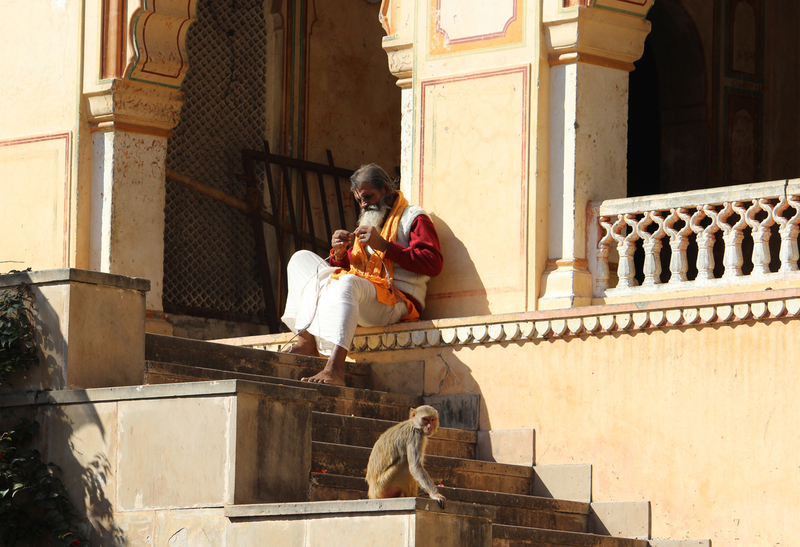 There is a huge temple in Jaipur that is dedicated and devoted to monkeys, although it is not a Haunuman temple. These red faced critters are a little more aggressive than the black faced ones roaming the towns of Rajasthan, but there are monkey handlers and holy men, like this one, around to keep them in line. Really they are more likely keeping the humans in line. The monkeys only become aggressive if teased or taunted. The monkeys are free to roam the property, they are free to leave, but they are fed and cared for here, so there is no need to leave. I spoke with the Swami that is leading the Sacred India tour I’ll be on in February. She is calling everyone to make sure we know what we’re in for. As I was describing my last trip to India I could hear the smile and wonder in my own voice. I could see the colors and landscapes and architecture. Even talking about the pollution and the smog didn’t dampen the mystical vision I was describing. This is one sacred place. I will be going to the east side this time, pretty far south to start then way up north into the Himalayas. Toward the end of the trip we will be a little in the middle north, not too far from where I was last time, but the experiences will be all new. I believe I could go back to all the same villages, towns and cities and stay in all the same hotels and still the experiences would be all new. Describing India is at once one of my most favorite and difficult things to do. Photos help, but there is a feeling there that can’t be articulated. The closest I can come is to say it is much like resting in the womb of existence. It all started here. Who knows if this next trip will be as magical, I’m willing to take the chance to find out. I would take that chance over and over and over again.